Key to this discovery was the SwRI-developed Lyman-Alpha Mapping Project (LAMP) instrument aboard the Lunar Reconnaissance Orbiter (LRO). LAMP uses the far-ultraviolet Lyman-alpha band skyglow and light from ultraviolet-bright stars LAMP to “see” in the dark and image the permanently shaded regions of the Moon. Using LAMP and LRO’s Mini-RF radar data, the team mapped the floors of very large, deep craters near the lunar south pole. These deep craters are difficult to study because sunlight never illuminates them directly. Tiny differences in reflectivity, or albedo, measured by LAMP allowed scientists to discover these two craters and estimate their ages. Collisions in space have played an important role in the formation of the solar system, including the formation of the Moon. Impact craters tell the history of collisions between objects in the solar system. Because the Moon has been peppered with impacts, its surface serves as a record of its past. Determining when collisions occurred helps scientists map the motion of objects in the solar system throughout its history. Craters that are young on geological timescales (millions of years) also provide information on the frequency of collisions. 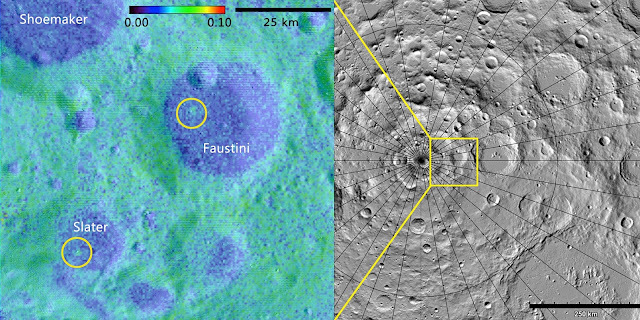 “LRO-LAMP Detection of Geologically Young Craters within Lunar Permanently Shaded Regions” is published in Icarus, http://dx.doi.org/10.1016/j.icarus.2015.07.031. This work was funded by NASA’s Lunar Reconnaissance Orbiter project.